$100 may not seem like much, but you can make it grow into more. Here are 10 clever ways to turn that $100 into a better future. Think $100 will get you nowhere? Not necessarily. You need the right attitude or $100 will just be... a few dinners. Don't think of it just as a set number. Think of it as the start to something bigger. Smart investments can help turn your $100 into a brighter future. You have to start somewhere. It all starts with intention. If you are like most, you look at each dollar as a finite resource. You probably use it to pay bills. If not, you spend it. What about investing? The stock market isn't the only way to invest. Here are 10 smart ways to invest your $100, including some less common ideas. Got more to invest? Here are smart ways to invest $1,000 and $10,000. You should be somewhat financially secure before you invest. This means having two things - an emergency fund and no credit card debt. Create an emergency fund. We recommend starting here before all else. You need money stocked away for a rainy day. You don't know when an emergency will occur. Ideally, you should have 3-6 months of expenses socked away in case you lose your job. Look for a savings account offering high interest. This will help your money to grow. Compound interest means that your interest will earn interest, so your savings will grow even faster. Our favorite savings accounts are HSBC and CIT Bank. Get out of debt. High credit card interest rates take away from your investments. Look at it this way. You pay a 15-20% interest rate on your credit card. Chances are you won't find an investment with that type of return. Invest in getting rid of your debt first, then focus on investments. Tip: If you have decent credit, consider balance transfer credit cards. You can get out of debt faster because you will get a period of time to pay off your existing debt interest-free. Use our balance transfer calculator to estimate just how much you can save on interest. If you're already in good shape on these two items, then it's time to start investing. Once you have your financial situation squared away, the fun begins. You can start investing. Here are our top 10 ways to invest $100. Automate with robo-advisors. When you only have $100 to invest, the last thing you want is large broker fees. This usually leaves stocks and bonds out of the equation. Instead, consider Wealthsimple, a robo-advisor. Robo-advisors provide online automated investing services. You enter your goals and your risk tolerance and the computer does the rest. It selects investments for you based on your inputs. There is no account minimum, so it's a great starter investment. To start building your wealth, visit Wealthsimple. You can even invest with your spare change. Link your credit and debit cards to Acorns and they'll round up each of your purchases to the nearest dollar. A computer-run investment program invests the change in a diversified portfolio. There's no charge to start an account, but you'll need a $5 minimum balance before they'll start investing for you. Acorns offers a low cost investment vehicle. They charge $1 per month for accounts worth less than $5,000. To start now, visit Acorns. Acorn is good for beginning investors. A word of caution, though - all investments are taxable on Acorns. They don't offer retirement accounts, which offers tax deferred savings. Tip: Have $500 or more to invest with a knowledge of how to invest? Consider Wealthfront. They are another robo-advisor that offers low trading fees. With Wealthfront, you can save for retirement, college, or standard investments. They waive the trading fees for the first $10,000 you invest, but do have a $500 minimum balance required. Keep in mind, though Wealthfront only offers digital account management. There are no humans providing advice or answering questions. Invest in Dividend Stocks. Stable companies that perform well on a regular basis often offer dividends to their stockholders. Even if you only buy one stock, if it's a dividend stock, you can re-invest the dividends and buy more stock. This way you increase your portfolio without depleting your bank account. To start investing, open an Ally Invest account. Invest in short-term cash investments. Certificate of Deposits (CDs) offer market risk protection for your cash while keeping it safe from being spent. You must deposit a fixed amount of money for a specified period. And you get interest in return. The longer you commit the money, the larger your return. 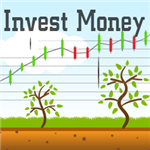 Read our comprehensive list of short term investments ideas. Lend to others. We aren't talking about lending your brother $100. We are talking about peer-to-peer lending. Companies like Lending Club and Prosper offer automated programs for you to invest as little as $25. You can lend your $100 to 4 different people. This helps diversify your risk and bring you a higher rate of return. P2P lending is often faster than traditional bank lending. It also offers a low cost way for borrowers to get the money they need. Lending Club and Prosper offer ratings for each borrower, so you can somewhat get an idea of your risk. The program does all of the work. You just sit back and make the profits. Tip: Read our detailed comparison of Lending Club and Prosper. Invest in your own personal development. This is absolutely a form of investment with the potential for a great rate of return. Taking classes and learning new skills can improve your earning power. Your $100 could turn into something much larger with the right strategy. 38% more likely to be contacted by recruiters. 31% more likely to land an interview. 40% more likely to land a job. Consider this: The average length of a job search is 40 weeks. For every week you're unemployed, you're missing out on each day's pay you aren't earning over a five-day work week. Studies have found that a professionally written resume is guaranteed to get you more interviews to land the job you want, faster. Even if this shortens your job search by just a day or two, you've made your money back, and then some. Think of it as an investment in your earning power. Take online courses: Learn or sharpen a skill with professional Udemy courses, webinars, or workshops. They can help you improve in your current job or get you started on a side job. Find a mentor: Is there a businessman you look up to? Or does your favorite web expert offer one-on-one coaching sessions via Skype? Getting advice from someone who has "done it" is one of the best things you can do to find a direction. Buy a pair of good exercise shoes: It's important to invest in your health. Even if your daily exercise is power walking around your neighborhood, it gives you more energy and makes you feel better about yourself. Invest in ETFs. Mutual funds usually aren't an option with just $100. They often require much larger initial investments. Enter ETFs. They combine a variety of securities into one investment. They often don't charge annual maintenance fees. But, you do pay a trading fee when you buy or sell them. We recommend sticking with ETFs that track index funds, such as the S&P 500. A great place to start is Stash. For just $5 you can start investing in ETFs. Stash makes it possible to purchase fractions of ETFs, which is how you can invest with just $5. They pool ETFS by category, making it easier for you to decide where to invest your money. What are ETFs? ETFs trade on the stock exchange, just like regular stocks. However, they are comprised of more than one stock, bond, futures, or foreign asset. They allow you to trade an entire market, such as the S&P 500 with one single fund. You can trade them as often as you want throughout the day. This is unlike mutual funds, which only trade once the market has closed for the day. Index funds. Companies like Charles Schwab don't have a minimum balance requirement for index funds. Take your $100 and invest in a variety of stocks. The basic index fund follows the S&P 500, but you can find many more. Index funds offer the diversification every portfolio should have. You'll likely have appreciating and depreciating stocks. The hope is that the appreciation is more than the depreciation so you still see a profit. Did You Know: You can invest in real estate with as little as $5. Check out Rich Uncles. Buy individual stocks. $100 might not buy you a lot of stocks, but investing in one right stock may make you money. Using a discount broker, such as Ally, can help keep your trading fees down. Ally offers research tools to help you choose the right stock. Investing in individual stocks rather than ETFs can help you do better than the market average. You can start investing with no minimum deposit on Ally Invest. Buy books. This doesn't mean your steamy beach read. We mean self-help books, whether it's to learn a new skill or to change your habits or mindset. Most often, the biggest obstacle to success is yourself. Any book that will help you change your ways could benefit you down the road. Here are a few of our book suggestions. Invest your $100 into these if you don't know where to start. Think and Grow Rich by Napoleon Hill. Though 80 years old, this is still one of the best books about success ever written. How you think affects what you can do in life. Unlock the power of your mind and learn how to make a rich life. Rich Dad Poor Dad by Robert T. Kiyosaki. This story of two dads - one traditional and one forward-thinking - teaches you how seeing money in another way can lead to a different future. How to Win Friends and Influence People by Dale Carnegie. Part of being successful in life is having people skills. This book teaches you how to win over people so you can get anything you want. Total Money Makeover by Dave Ramsey. Carrying debt reduces your chances of ever striking it rich. In this book, Dave Ramsey tells it like it is. He helps you understand the importance of living the life you can afford, not striving to keep up with the Joneses. Plan for retirement. $100 won't get you far in retirement, but if you are still young, that $100 could be much more in 20 years. 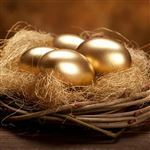 It's always a good idea to invest in your employer's 401(k), especially if your employer matches contributions. Most employers withdraw the money right from your paycheck each pay period. You set the amount and your employer handles the rest. Don't have a 401(k)? You can open a Roth IRA and invest your money yourself. Ally Invest has no account minimum. Save for college. $100 won't even buy your kid a college textbook these days, but it's a start. Anything will help reduce the student debt down the road. Set up a 529 fund and start saving now. As a bonus, you get the tax savings, which furthers the return on your investment. Start a business. You don't need much to start a business today. And you don't even need much specialized skills. Get creative. Make yourself look professional by getting a pack of business cards for as low as just $10. There are many small businesses you can start for as little as $100. Whether you work the business full-time or operate it as a side hustle, it can help you bring in money. Prefer to work with your hands? Use $100 and buy some cleaning products and clean busy neighbors' houses. Like animals? Become a pet sitter. All you need is the gas money it takes to drive to the pet owner's house. Are you computer minded? Set up a blog for less than $100, which gives you an opportunity for affiliate marketing. Good at helping others? Become a virtual assistant/personal concierge. All you need is a phone, computer, internet, and perhaps some work software. Are you artistic? Many people are looking for handmade cards and invitations. Invest in some supplies and you can be a calligrapher or watercolor artist. Sell for a profit. Flipping isn't just for houses. You can flip products too. If you have a seasoned eye for hot items at estate sales or on Craigslist, go for it. Take your $100 and buy those items. Turn around and sell them for a profit and you have an instant return. This is a great side hustle gig as it doesn't take a lot of time and has very little overhead. You can do this in your free time, while still making your full-time income. These types of "investments" will not only NOT make you rich, but risk losing your hard-earned money. Penny stocks: Penny stocks are very cheap stocks trading at under $5 per share. You may think with $100, you can buy a bunch of shares. But these are dangerous because the companies are small and are not required to be transparent about their financials. So you essentially have no idea if it's a worthless company or not. Pyramid schemes: This scheme operates on the model that you are paid when you recruit more members into the program. It's just impossible for everyone to keep on making money down the pyramid. So if you are asked to pay to join a company and to recruit more members, beware of a pyramid scheme. Get rich quick schemes: You know the ones. Often, these will promise you high returns for little risk, while you get to work from home. Nope, you just know it's too good to be true. Gambling: Don't throw that hundred away at a table in Vegas. Haven't you heard that the house always wins? Powerball: You probably shouldn't blow your $100 on lottery tickets as your odds of winning are only 1 in 292.2 million. But, if you are looking for a little fun, maybe you'll get lucky and hit a few numbers. Invest it in your emergency fund? Invest it in your debt to help your financial situation? Want to see it grow, such as in an investment? Want to invest it in yourself to help yourself grow? This takes some soul searching. Figure out where you are in life. Do you have 6 months of your expenses stocked away? If not, create an emergency fund. Do you have credit card debt? If you do, get out of debt. If your finances are in good shape, then let's start building wealth. Honestly, the most important factor is that you start now. It doesn't matter that you only have $100. It will turn into more soon. If you don't start, though, your money never has the chance to grow. Make smart decisions now and reap the rewards in the future. One day you'll be glad you invested that $100 bill. Editorial Note: This content is not provided by HSBC. Any opinions, analyses, reviews or recommendations expressed in this article are those of the author's alone, and have not been reviewed, approved or otherwise endorsed by HSBC. This site may be compensated through the Advertiser's affiliate programs. For rates and fees of the HSBC Gold card, please click here. 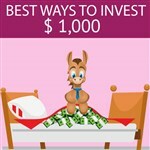 Leave a comment about The Best Way to Invest $100?